–Fermob Spring Discount at Weekender House (through 4/16). –Kittery Celebrity Chef Breakfast at the Kittery Community Center (8:00 – 9:30). –Learn to Draw Art Class in Exeter (1:00). –Restorative Yoga at Soleil’s Salt Cave (5:30 – 7:00). –Creative Sign Workshop at The Shops at Cape Neddick (6:00 – 8:00). –Stan & Ollie at The Music Hall (7:00). –Catapult Connects at b.Bar (5:30 – 7:30). –Meditation Meetup at the York Public Library (6:00 – 7:00). –Who’s Line is it Anyway? With Drew Carey at The Music Hall (7:30). –Happy 2nd Birthday to Pure Barre Portsmouth! (Celebrations April 11-14). –20th Birthday Celebration at Summer House Furnishings (10:00 – 6:00). –Sugar Egg Soiree at Fezziwig’s Food & Fountain (4:00). –Happy Hour at STREET’za (4:00 – 6:00). –Beer Release at Garrison City Beerworks (4:00 – 8:00). –Spring Fling at Whims & Whatnots (5:00 – 8:00). –Empty Bowls Community Benefit Dinner at the Shapleigh School (5:00 – 7:00). –Béla Fleck & Abigail Washburn at The Music Hall (7:30). –Lou Barlow at The Word Barn. –Thursday Night Jazz at Federal Cigar Dover (8:00 – 11:00). –Patriot’s Day Celebration in Ogunquit (all weekend). –Birthday Weekend Open House at Three Bridges Yoga (all weekend). –JAVA Perkins Cove opens for the season (7:00). –Brad Marino Record Release Show at The Button Factory Stage (7:00 – 10:00). –OURBIGBAND at The Press Room (8:00). –&More at The Music Hall (8:00). –Bike Swap & Sale at Philbrick’s Ski Board & Bike (Saturday + Sunday). –Anniversary Sale at Bell Farm Shops (Saturday + Sunday). –Out of Hibernation 5K in Portsmouth (9:00 am). –Walk MS at the Little Harbor School (9:00 – 12:00). –Vinylfest 2 at Book & Bar (10:00). 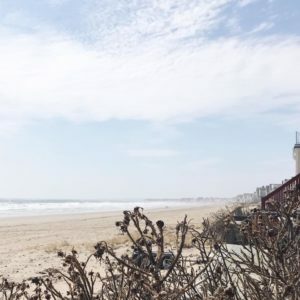 –Beach Cleanup at Jenness Beach (10:30 – 12:00). –“Build a Better Bonnet” Workshop at Snug Harbor Farm (1:00). –Art Opening Reception at First Hill (2:00 – 4:00). –Historic Tour of The Music Hall (4:00). –April Wine Tasting at the Captain Lord Mansion (5:30 – 6:30). –Irish Music at The Dance Hall (7:30). –Jim Rioux and Eric Ott at The Button Factory Stage (7:30 – 10:00).